Google My Business (GMB) listings and website visibility in search results have a huge impact on local businesses. But there is a problem: Many small businesses have no feel for how their digital properties are performing. Even though data is freely available, through tools like Google Analytics, they don’t have the time to pull it all together and make it work for them. Small businesses can harness data, but it has to be presented in a way that is clear, action-oriented and easy to access. Focused dashboards can help a business understand how they are doing and take action quickly and confidently. This type of dashboard can be built with Google Data Studio. We can bring the right information into one place, format and present it in a way that small businesses can use, and make it accessible to those who need it. What makes a good local marketing dashboard? Focused – Designed for the user with enough information for quick assessment and action but no more. Easy – Easy to read, easy to interpret, easy to access. Optimized for mobile. Valuable – The right information in one place saves time. Promote action and inspire confidence through feedback. I have created two free dashboards that meet these demands. They are designed to meet the needs of the intended user as simply and quickly as possible. They are free to copy and modify for your own use! Local Marketing Results V3.0 – Google Analytics and the Jepto GMB connector combine to make a totally free, streamlined view of the most important KPI’s for local business. GMB Mobile Dashboard V1.2 – Using the premium Supermetrics connector to make a super actionable Google My Business dashboard for business owners and managers. This dashboard is set up for quick reads on mobile phones. Or, you could embed it on a web page as I have here. This is not an image! It is a live updating report built with Google Data Studio. Once it is activated it does not need rebuilding! The default shows the last 28 days, but the user can change the dates right on the report. The Website Metrics Section keeps the user focused on site goals. We show visitors from the most important sources of customers they have influence over: Organic and Social. The Google My Business (GMB) section highlights user interactions with the GMB listing. Phone clicks are usually the most important metric for small business. We include post views , directions and link clicks as important secondary measures. Each section comes with simple actions the user can take to effect the metrics. The website data comes from Google Analytics and the GMB data is coming from the Jepto Google My Business Data Studio connector. This simplified setup means this dashboard is really and truly free! This dashboard is available to copy. After making your own copy you can connect your own business data sources to the report. See the section below for instructions on how to make it your own! How to use this free web + GMB report for your own business or your client. Create a new GMB data source by using the free Jepto GMB Data Studio Connector. Connect to your GMB listings. Click here to get started! Jepto Google My Business connector. Create a Google Analytics data source using the free connector. When you first see the report it will look HUUUGE! This is because it is designed for mobile and set to take up 100% of the screen. Don’t worry, when you are editing it will look normal size. Make a copy using the copy button. You will be given the option of using your own connectors. Select the connectors for your own data sources and continue. You now have your own live copy of the report! If you do not see your GMB data, modify the filters on the GMB section so they only get data for the correct listing. 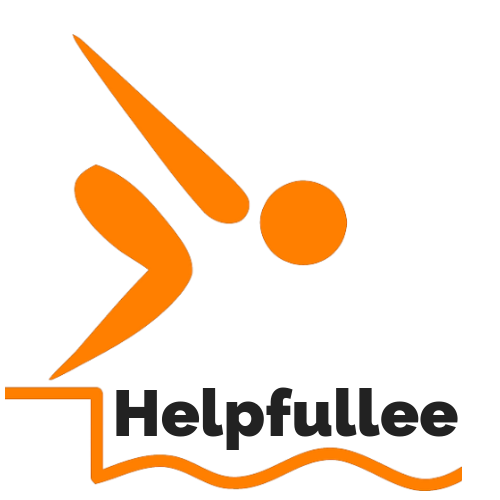 Customize the report – You can easily replace the Helpfullee logo and change the metrics / color scheme etc. If all this is new to you, I created a short video on how to steal, er… copy, a report that you might find helpful! This GMB dashboard is designed for managers in charge of monitoring and updating a GMB business listing. The slim design of the dashboard makes it ideal for phone use, or it can be embedded in a web page. Most of the information in this dashboard is available in GMB, but it is scattered around different sections making it hard to tell what needs to be done. By bringing the important information together in one place it is easier to monitor the aspects of the listing the business needs to focus on and take action. The Reviews section gives the manager a quick view of one of the most important aspects of a GMB listing. This section makes staying on top of reviews, and responses much easier! Can you see how a manager can tell at a glance if reviews and ratings are moving in the right direction? You can easily tell if a review is missing a reply. This leads to faster fixes and response times. The Posts section provides a quick overview of how this underutilized feature is performing. Most businesses should be posting regularly. Most posts have only a week of visibility on the listing, so they need to be refreshed regularly. You can think of this as similar to a social media posting. Unlike other web activities it is possible to see results from creating posts almost immediately. A simple time chart is used to give the user a feel for how posts are being viewed and how performance varies over time and compared to the previous period. The scorecard boxes are a reminder and feedback to encourage regular posting. The detail table gives some limited information about each post and its performance so the user can verify that the posts are being published as expected. The Search section provides some high level information about how people find the GMB listing. We chose to focus on Brand and Term (Non-Brand) searches and total views. It can be hard to find actions that directly effect search metrics. Still, it is helpful to know how brand and non-brand searches are trending and it is easy to spot spikes, dips and trends in the chart. This encourages regular monitoring without getting lost in lots of charts and graphs that come in the standard GMB interface. Some important info about report values: GMB does not currently publish data on the most recent 3 days. This is true whether you are using the standard GMB interface or you are pulling the data into a report as we do here. Google has said they will update this in the future but they have not specified when. You can set your own reporting period with the date selector after the report loads. However, Data Studio does not allow you to set default end dates to 3 days ago (at least not yet). This means there is a built in 10% discount for the current period compared to previous for the default dates. I feel that period comparisons are important enough to keep in the reports, even with this issue. I deal with this by simply assuming there will be a 10% loss by default. So, I am not alarmed by a 12% loss of last period, and I mostly use the charts to detect issues in the search metrics section. This report is publicly accessible, and free to copy and modify – but there is a catch! This version uses the Supermetrics GMB premium connector. The Supermetrics connector provides visibility into much more detail than the free Jepto connector. It also has much more information that may be useful to GMB managers who have to manage multiple listings. In order to duplicate this report for your own GMB listings you will need to purchase a Supermetrics connector subscription. The Supermetrics GMB connector is available starting at $220 per year, or as part of their Data Studio connectors package starting $1,188 per year which gives connections for many other data sources. Their individual connectors can also be purchased on a monthly basis for about $24. All connectors are available on a free trial basis. This can be a great deal if it saves you enough time. I can tell you that I have a full subscription and find them to be very cost effective. If you would like to know more about them just search for Supermetrics , or if you would like to support my efforts in creating information for the larger community use this affiliate link Supermetrics for Data Studio. 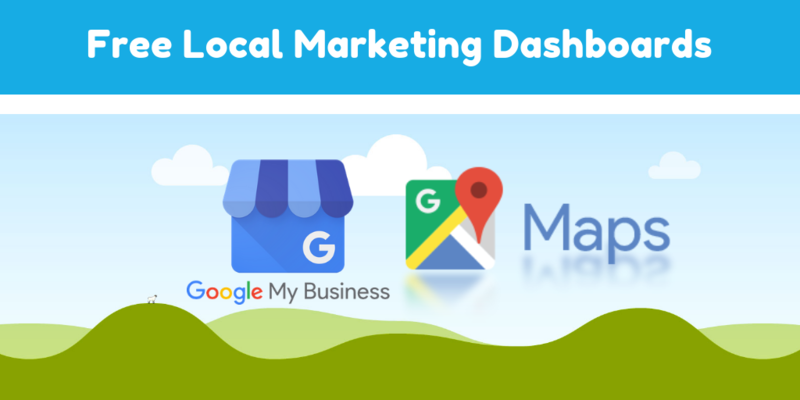 Want more info about local marketing dashboards, Google My Business or Google Data Studio? Google Data Studio has made many areas of reporting and analysis available to everyone. That said, many of these options are new and there is a lot to learn! If you would like some more information on local marketing dashboard design you should check out the excellent Whiteboard Friday presentation by Dana DiTomaso from Moz. There are many options to consider when building reports and dashboards. I went through several iterations trying to get these as lean and useful as possible but if you have suggestions for improving these examples, or anything else, please leave comments below. Your feedback is truly appreciated!